When I sit down to outline the events of the month, I scroll through the gym’s Instagram and Facebook feeds to make sure I’ve covered everything. As I put together a timeline for March, I was blown away by how much there was; which may explain why I’ve been pretty tired the last couple of weeks. It is just a reminder of how lucky I am to be a part of this Unified community. One priority of mine going forward is to “teach” more through the blog, Instagram, and Facebook pages. I want this to be a resource for my members as well as cater to the Instagram world where infographics (especially in the fitness industry) are becoming more and more popular. The Adaptive Fitness Instructor series will be about a dozen posts shared over the course of the next few months that highlight unique exercises that we use as teaching tools or to regress/progress certain movements. Progressions to Improve Athletic Performance also will highlight a series of progressions that we use to develop certain athletic qualities. I will translate both of these from Instagram format into blog posts so they are easily accessible through all mediums. With a lot of support from a friend, we rebuilt www.unifiedhp.com using a different platform; one that allows me to process membership payments, share the blog posts, announce events like the Unified 5k. To a first-time visitor, the new page better represents the variety of services that the gym offers. If you haven’t already done so, check the new page out. ﻿This is the fifth year that our Central MA Spartans basketball team has qualified for the Special Olympics state tournament. This year our four games took place at Shrewsbury High. Due to our strong performance in qualifiers we were placed in a high division and ran into some very strong teams. We played well in all of the games but only came out on the winning side in one of the four. The team is already looking forward to next season. One of our members, Jen Hedstrom, is also a yoga instructor and over the winter completed an adaptive yoga course. 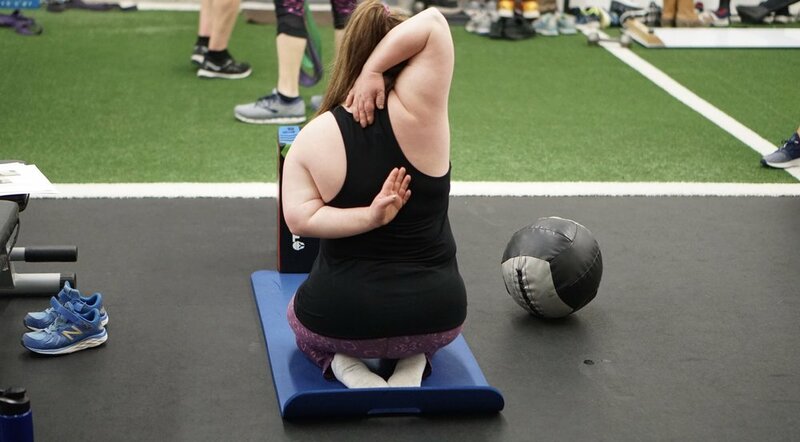 She is piloting an inclusive yoga program at the gym and so far attendance and feedback has been great. We are hoping to make this a staple in our offerings. One of our former interns, Mike Curtin, is completing an independent study with the Health Sciences department at Stonehill on the effects of Iyengar Yoga on measures of stability in young adults with Down Syndrome. We used a Functional Movement Screen (FMS) as a pre-assessment and participants will be completing an Iyengar yoga routine at the end of their workouts twice a week. A longer write-up to describe the project will be featured on the blog soon. After a couple of weeks back and forth with the Lancaster police department and a couple of timing companies, the Unified 5k became a reality. Over the next couple of months I’ll be finalizing everything from medals, to t-shirts, sponsorships, and advertising. You can visit www.unifiedhp.com/unified5k for more information about the event. The new website also allows me to send out more polished newsletters that link to the 1 or 2 posts that I put out during the week. This platform also lists past blog posts so I can link to them if they answer certain questions that come up. If you aren’t subscribed to the newsletter, visit www.unifiedhp.com/blog and hit subscribe at the top. The week of March 25th, three of our athletes made their college decisions. John Foney will be attending RPI to play football, Hadley O’Sullivan will be sailing at Salve Regina, and Josh Stams will be playing football at Rochester. Looking forward to the next five months of preparation to help them be in the best position possible to be successful when they step on campus. ﻿The Hoyts invited me and Lauren to join them at the Easter Seals Evening of Empowerment night at the Burlington Marriot. Easter Seals is one of the largest disability service provider organizations in the country. They offer assistive technology, programming, and much more to address their mission “Live, Learn, Work, Play”. Easter Seals current CEO, Paul Medieros, and past CEO, Kirk Joslin, have been great resources and supporters of my gym over the last few years. Team Hoyt New England (THNE) builds their race schedule earlier in the year so with me planning my race this late in the Spring, the Hoyts had already established what local races they would have a presence at. Thanks to Diane and the approval of the other board members, they added the Unified 5k and Fun Run to the THNE schedule. This means that the Team Hoyt trailer, chairs, and the Hoyts themselves will be at our race. To be associated with the Hoyts was something that I never imagined would be possible. It is an honor.